JASPER, Ga. – The Jasper City Council held a town hall in the midst of circulating rumors about the garbage collection services. City Manager Jim Looney presented two outside proposals for the city to take over the garbage service from the city and details about those garbage services and what they would mean for the city. One proposal offered street side service costing slightly less than the other that offered backdoor pickup. Despite the offers, citizens quickly began asking why Looney didn’t include a third option for the city to maintain the service. Looney quickly responded saying that it was an option, but he was simply noting the outside proposals with set prices. Overwhelmingly, the citizens present for the meeting as well as downtown businesses began saying that they enjoyed the people working for the county and felt their service was beyond compare. As such, suggestions began rising that they would be willing to pay more if it meant keeping the current service going. Others complained about bringing in an outside service saying that restaurants downtown would have nasty and smelly trash on the sidewalk every weekday waiting for trash pick-ups whereas the current service provides backdoor pickup. Even with one of the outside proposals offering a similar service, citizens said the current workers have consistently responded to extra needs and requests without complaint, a service they highly doubted would continue with a commercial business operation. Giving examples like times when a box was forgotten or something was missed, the city’s servicers readily returned to fix issues. It was added that the reason these issues could be resolved quickly and easily was citizens direct contact with the operators. With an outside company, the city would become a “middle-man” between the citizens and the company with the city collecting the fees and paying the vendor. Likewise, the city would still be handling much of the trash issues as citizens would contact them with issues and they would contact the vendor. UPDATE: Discussing the issue one week before their monthly meeting, the city saw no action on changes to a vendor or fees as of yet regarding the garbage service. As they continue discussions on the topic the item sits on the agenda for November. 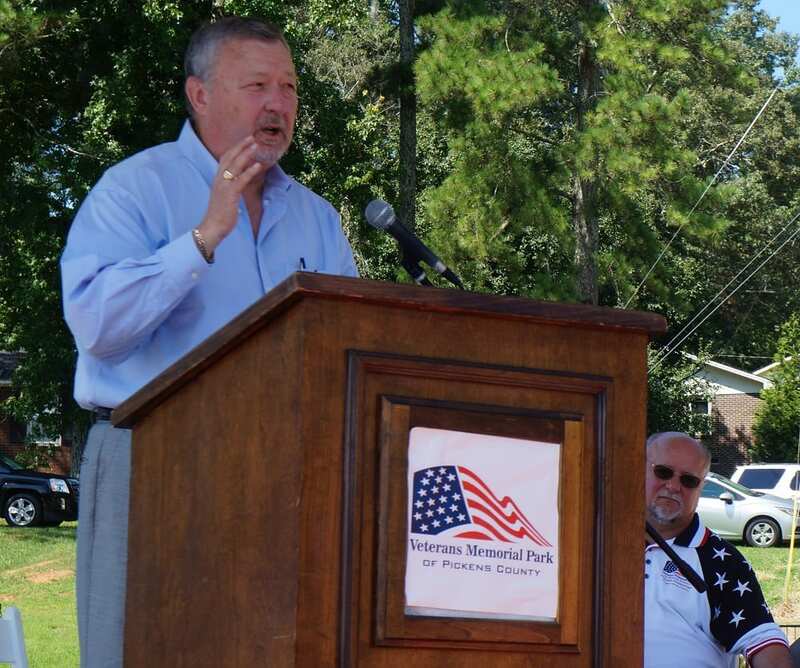 JASPER, Ga. – It’s not Veterans’ Day, but you might think it was if you were in Pickens County on August 9 as they finally dedicated their long-awaited Veterans Memorial next to Lee Newton Park. Al Parson Larson honors his and others’ service with his final wearing of his uniform from World War II. Situated at the edge of the parking lot on Stegall Drive, the Memorial opened for the public with an official dedication at 11:00 a.m. The dedication saw the colors of each military branch set in honor at the site while veterans and members of the American Legion hung the American Flag over the memorial. While several people offered words to sanctify the grounds, they added an offering of the 21-Gun Salute and “Taps,” as well. The ceremony’s impact was only dwarfed by the size of the crowd that attended the day to offer thanks and respect to those who served. Most of them are veterans or have veterans in their family, a fact noted when a speaker asked these people to raise their hands during his speech. The Honor Guard presents the military branch flags beginning the ceremony of dedication for Veterans Memorial Park. Attending the event with his son, Larson was one of the few attending the event in uniform, and hundreds more who bore caps, shirts, and more signifying their service. But this photo, according to him, will be one of the last photos ever taken of him dressed out. 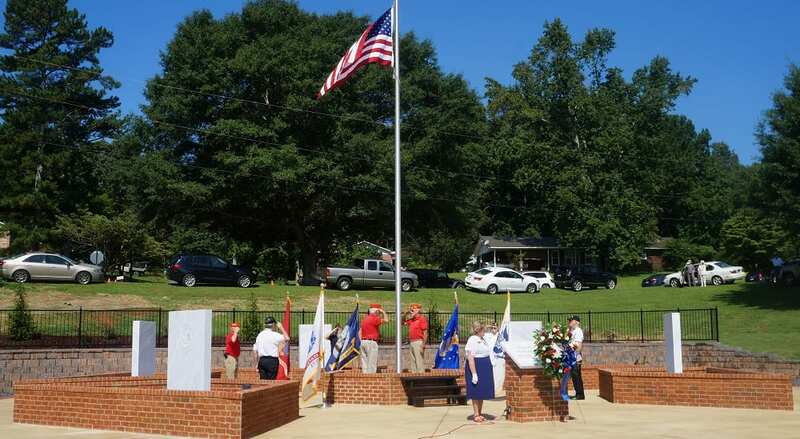 Veterans Memorial Park holds 5 smaller monuments in individual bricked in areas becoming part of the larger memorial that hosts bricks of honor for those who wish to purchase them in order to help build, expand, and maintain the memorial. Hoping to extend these bricks across the hillside, they confirmed they are still selling the bricks and will continue selling them indefinitely. John Trammell, President and CEO of Community Bank of Pickens County, offers his words at the dedication of Pickens’ Veterans Memorial Park. One speaker noted that 1% of Americans have served in the military, but looking at Pickens County, 12% of those in the county are veterans. Looking at this statistic, it has long been a need to honor that large portion of the community. But the honor is for all those who serve. The memorial has been a long time needed and a long time coming, but today it is finished. It stands as this county’s tribute for those in service. Make sure to check out more photos of the day at FYN’s Facebook Page. Shottenkirk Ford in Jasper, GA invites you to come visit! The new management team, led by John Higham, is ready to do business the way the customer wants – great deals combined with great service! Shottenkirk Ford wants to take care of its customers and the community. Shottenkirk Ford in Jasper, GA wants you to drop by. Whether you need a new vehicle, service, or just want to check out all the great deals, you will always be met with a smile at Shottenkirk Ford. The new management has created a great place to see the new Ford lineup or help you with service for your vehicle. They are waiting to show you around and help you anyway they can – they want to make you feel at home at Shottenkirk Ford. The service crew will give you affordable, dependable service from your tuneups, oil changes, or tires for your auto. They will take care of you with a smile and keep your auto in top shape! They also offer pickup and delivery for service. You will enjoy the new layout which makes it easy to see all the great cars and trucks on the lot. From the fuel efficient to the four wheel drives they can find the right auto for you! You will enjoy a friendly – no pressure atmosphere and enjoy getting to know your friends at Shottenkirk Ford…so what are you waiting for? It’$ not the top line…it’$ the bottom line! Do not be misled by the hype of the inflated MSRP on packages included on the window sticker SHOWING big discounts. Check it out for yourself. Transparent pricing means you see how we get to the price and post it on the website! “It’s not the top line, it’s the BOTTOM LINE that makes it a SHOTTENKIRK FORD OF JASPER DEAL! Come be a part of our family!